Has 'impatient' Torres jumped too soon? Chelsea fans were eager to see their new number nine in action, but it was the fans of his former club who were left smiling. Fernando Torres has left Liverpool for pastures new - for a team which he claims can help him to the prize he now most covets, a Champions League winner's medal. Chelsea are in the last 16 of this year's competition but Sunday’s defeat to his former team Liverpool has dented their hopes of gaining a top four qualification spot for next season's campaign. What if the surging Reds finish ahead of Chelsea in the league and make Europe’s top club competition instead? How silly will Fernando feel? In his place, King Kenny Dalglish has brought in two new strikers. Luis Suarez and Andy Carroll are exciting prospects, but neither is ‘El Nino.’ Neither has that turn of pace –- the magic weapon of Torres at his best. Granted, both hopefully will have a better work rate, more of a team ethic, and a less sour look when things aren’t going right. Both will also surely know what playing for Liverpool - England’s most successful club - under a legendary manager, means. The fans know it. Liverpool may be down, but are certainly not out. And that’s what Torres failed to understand. Why couldn’t he have waited until at least the end of the season? Under Dalglish the players look more sprightly, the football has been more creative, the tactics have been more astute, the results are improving and Torres was looking back to his best. The future at Anfield is looking so much brighter than in the past few months -– but our World Cup and European Championship winner decided to jump ship and swim to a team which has not won the Champions League, unlike Liverpool in 2005, despite massive investment. South African star Steven Pienaar recently turned down the chance to play at Chelsea, picking Spurs instead because he said they play more exciting football. Certainly the future looks healthy at White Hart Lane. Can the same be said for Stamford Bridge, where managers come and go depending on the owner’s mood and many of the top players are ageing? Though we don’t know what really went on behind the scenes at Liverpool (rumors were rife that though the players respected Torres, they didn’t much like him), it’s arguably all come down to impatience. Torres wants to win things now and Chelsea are in a better position than Liverpool, at this moment in time, to bring home silverware, but he is cup-tied and cannot play as they continue their defense of the FA Cup. It brings me back to 2004 when Michael Owen left Liverpool for Real Madrid saying he wanted to win trophies. The very next season the Reds won the Champions League, while he was sold to Newcastle with nothing to show for his solitary term in Spain. It will be interesting to see if Torres’ dreams are fulfilled at Chelsea or whether his stint in London will turn into a nightmare. he wont hesitate, if Roman decides not to invest heavily in the future,to whinge and moan again,but i do hope the Chelsea fans see him in full flight as it most certainly is a sight to behold. He should have given Liverpool until the end of the season, then again who's going to stay at a club if your not liked by your teammates. One game. Not even a whole game, and Torres has made a mistake! What a ridiculous knee jerk reaction. Torres left for a club that's not living in the past. Liverpool is England's most succesful club? Statistically, yes, but what have they won lately or even come close to winning? Nothing. NESV has brought in some financial muscle, and King Kenny has brought back some nostalgic self belief, but Liverpool did not change from a bunch of no hopers back into one of the EPL's big four in the space of a few weeks. Torres is an obnoxious whinger but he got one thing right - footballers in their mid twenties have to live in the here and now. He didn't have 5 or 6 years to wait for Liverpool to rebuild. He needed a club that's already in the fast lane, which Chelsea is. Alright, broadly speaking they're a team in decline, but they've not fallen as far as the Reds did, and if history is anything to go by, they have an owner who's willing to just buy another set of players when the current crop get too long in the tooth. We don't yet know how deep the pockets of NESV are. And even though a couple of big signings have lifted morale, you don't solve such a deep malaise overnight. Obviously, Reds' fans want to believe that their team has turned the corner. But Torres, who was on the inside after all, saw it differently, and there's nothing wrong with that. It's his life. Good article Candy – I wonder if Torres is already having doubts. He looked fairly miserable at Chelsea's defeat to Liverpool on Sunday. Chelsea have an amazing squad and have been formidable over lst few seasons but the squad hasn't changed much and is starting to get a little old and set in its ways. I think Torres will struggle to set his mark with Drogba and Anelka still sniffing around for goals! He should have moved to Man Utd, then he'd be playing for the best team in the world, and still wearing red, and nowhere near those cockneys. Very sad that Torres has left Liverpool.Let us hope the new signings keep up the good work and get Liverpool back into the to 4! It is way too soon to say Torres made a good or a bad decision but for arguments sake, I'd say it was a great decision. Both teams are better off with the way things turned out. Liverpool may be out a World cup champ and what not but they scored two outstanding young footballers that will more than compensate for the loss of Torres. (Even though Carroll was overpaid, but then again so was Torres.) Chelsea has been off all season and it will take time to get their chemistry flowing together again epsecially with the addition of Torres. Sure you can say he jumped the gun leaving but just how long is he supposed to wait around at a team where he is not well liked even if he was respected. Torres will show why he is worth so much in the upcoming seasons and i predict liverpool won't lose a step with suares gunning for goals. Football is a team sport and one player does not make the team! Give the guy a chance to get used to his new team and then make a judgment call! That said, the amount of money paid for him is utterly ludicrous! The Andy Carroll purchase price is also way over the top, from a nobody to one of the most expensive players in one move, surely not. i taught it a practice in epl not sale a player to a rival club.so why leverpool agreed for a breached of ethics. Manutd cannot do such a nonsense thing. why why why leverpool? i totally agree on torres being impatient.under king kenny what has really changed is the mood,the attitude and confidence level among the players, and not just tactics.its a brilliant resurgence and little needs to be mentioned at why the players are beginning to sing the song of LONG LIVE the reign of king kenny and i wouldnt agree less. If the World Cup winner you're talking about is the one who missed his goal while being plastered on the ground at the final whistle, then yes, Liverpool are very lucky to have 50 million. One game. Not even a whole game, and Torres has made a mistake! What a ridiculous knee jerk reaction. Torres left for a club that's not living in the past. Liverpool is England's most succesful club? Statistically, yes, but what have they won lately or even come close to winning? Nothing. NESV has brought in some financial muscle, and King Kenny has brought back some nostalgic self belief, but Liverpool did not change from a bunch of no hopers back into one of the EPL's big four in the space of a few weeks. Torres is an obnoxious whinger but he got one thing right – footballers in their mid twenties have to live in the here and now. He didn't have 5 or 6 years to wait for Liverpool to rebuild. He needed a club that's already in the fast lane, which Chelsea is. Alright, broadly speaking they're a team in decline, but they've not fallen as far as the Reds did, and if history is anything to go by, they have an owner who's willing to just buy another set of players when the current crop get too long in the tooth. We don't yet know how deep the pockets of NESV are. And even though a couple of big signings have lifted morale, you don't solve such a deep malaise overnight. Obviously, Reds' fans want to believe that their team has turned the corner. But Torres, who was on the inside after all, saw it differently, and there's nothing wrong with that. It's his life. Football is like that, as players we come and go. You have to understand his decision, he felt it was a good opportunity to continue developing. The club has to look forward and forget Fernando. He is not here anymore and we can't do anything but wish him a lot of luck. He has experience and confidence. He didn't show problems or nerves before the game. He was excited to play. We have to give him time to adjust to the shape. He will do it quickly. In fairness to Torres, he was given no time on the ball as Liverpool's decision to employ three centre-backs crowded the Spaniard out of the match. But Chelsea fans could be forgiven for feeling more than a little concerned with the subdued way Torres responded to that challenge on one of the biggest days of his career. However, it is simply a matter of allowing Torres time to establish a rapport with Drogba. The Italian's job could depend on how well that partnership fares in the Champions League as Chelsea, now 10 points behind Premier League leaders Manchester United, having virtually no chance of retaining the title. i believe Torres made the right decision and that kind of opportunity comes once in once life tme, lfc management frustrated RAFA and others, so, Torres doesnt have much time on his side to waste while the lfc is not helping matters.he left lfc for good and he will succed in chelsea.he has all the luck on his side. I think the most die hard Liverpool fans will thank him for what he did for 2 out of the 3.5yrs. Maybe he needed a new challenge but there are things that you can't simply forget which is why there is so much annoyance. Body language, attitude, sulking, declaration that he was staying, loved the club etc etc. Then he has blown it today with the 'big club', 'moving to win things', 'my destiny to score against Liverpool' comments. He could simply have said that he needed a new challenge – he is either dim or doesn't give a toss about Liverpool and is a self-centred money grabber. If he does score I wouldn't be surprised if he kisses the Chelsea badge. The man has shown little integrity thus far and I'm actually glad he has gone. Fernando Torres is a skillful striker. Give him some time to express himself and he will do justice to his talents. 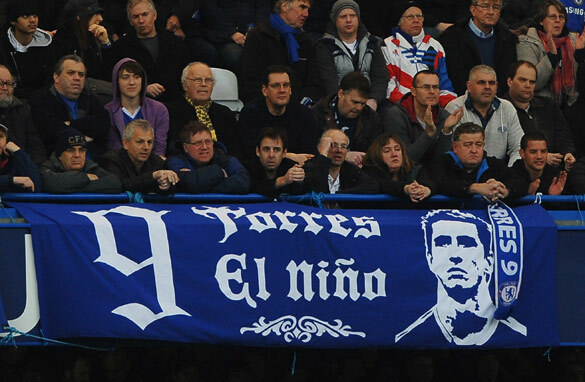 Best wishes to Torres and to his legion of admirers. This is a mixed bag of fortunes as Torres' success at Chelsea will depend on how well he gets on with the players and how effective the midfield will be in feeding him the balls he needs to score those vital goals! At any rate he wasn't growing any younger so he had to think about his future! An opportunity came by offering him good money and playing although he'd started picking up under King Kenny as he was scoring some of those vital goals! That chemistry between him and Gerrard he surely miss and I only hope that he gets the same kind of service from Malouda who'll pass the ball to him! As this is a team sport it all depend on how he can gel with Drogba, Anelka, Kalou and Malouda plus Lampard and the like! 50 million pounds to me was on a very high side and by May this year should know whether it was a wise buy or not! There's the aging factor within Chelsea, will they be able to keep up with Torres' pace? Only time will tell!